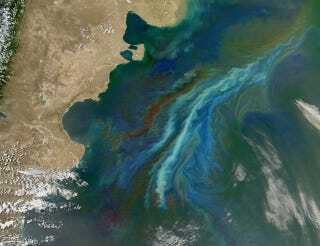 The milky green and blue bloom developed in an area known as the Brazil-Falklands Confluence. It's where the warm salty waters of the subtropical Brazil Current flow south and meet the colder, fresher waters brought north from the Southern Ocean by the Falklands (Malvinas) Current. Where these currents collide along the continental shelf-known to oceanographers as a shelf-break front-turbulent eddies form and pull nutrients up from the deep ocean. Also, the Rio de la Plata runs off the land and deposits nitrogen and iron-laden sediment into the ocean just north of the area shown in the image. Add in some strong summer sun, and you have a bountiful feast for the microscopic, floating plants-phytoplankton-that form the center of the ocean food web. Those plants become food for everything from microscopic animals (zooplankton) to fish to whales.